He’s gonna phone me, soon. He’ll ask whether I want to join him again. Standing in a barn, 3 days, 1 extra for lifting up our foreign beer stand, selling ales to a mainly in lagers interested crowd. And I’ll be sleeping in the Hilton, which is a brick of containers, having English breakfast in The Sportmens Cafe. And during daytime I’ll be walking in the surroundings of Canterbury at bridle roads I already know from the years before. 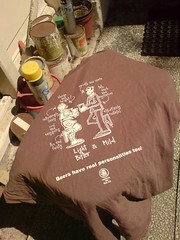 Each day I’ll be looking at the T’s T-shirt-man is selling, at moments he’s not watching. To finally decide that there is just 1, just 1! T-shirt I want to take with me home. But I’m afraid I’m gonna say I won’t be going to Canterbury this year.